ERC Wiping products recently added several products to its GSA Schedule. Orange Peels Brand Waterless Hand Wipes are presaturated with a powerful orange formula to remove oils, paints, grease and other residues from hands. Also added are 22-by-44-inch White 100 percent Cotton Bath Towels and 12-by-12-inch White 100 percent Cotton Washcloths, ideal for athletic and fitness centers. Recycled GreenX Cloth-Like Wipers are made from 40 percent post-consumer recycled fibers and 10 percent post-industrial recycled fibers and are great for general purpose wiping applications. Pentair Water Commercial Pool and Aquatics is now offering a complete line of eco-friendly commercial pool equipment products designed to help aquatic facilities save money. These essential pump room products together offer tremendous efficiency and savings from reduced energy consumption. The products include the new PowerMaxTM Heater, the EQ Series® Pump, CS400 Backwash Controller and the new Acu-Drive XS variable frequency drive. Cover LOGIXTM Safety Covers from Vyn-All Pool Products introduced a new fabric to use on safety covers when closing commercial recreational aquatic facilities. New SUNGARDTM Mesh is a lightweight, ultra-fine weave that filters out sunlight and up to 40 microns of debris yet allows water to drain through. This lighter weight material makes installation and removal of safety covers much easier than traditional safety covers. Plus the new filtering fabric keeps sunlight out so pool water is cleaner when opening pools in the spring. 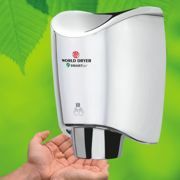 Commercial Restroom Products, a distributor of GREENSPEC and hands-free restroom products announced the addition of the SMARTdriTM "Best of the Best" automatic hand dryer from World Dryer. Features include intelligent on/off heating option and a three-speed motor to accommodate all applications. Savings of around 95 percent compared with paper towel costs, and it is extremely efficient, using only 33 percent of the energy of traditional dryers and 45 to 65 percent of the energy of competitive high-speed dryers. Now every table in your public areas can be fully accessible and fully useable by everyone. This sleek, stylish picnic table design is accessible to wheelchairs at both ends, plus it offers full-capacity seating. These patented W-Series Pilot Rock brand tables can be 6, 8, 10 or 12 feet long, and meet or exceed current ADA guidelines. Many colorful frame finishes and top/seat materials are available. The Universal Access Table is ideal for patios, food courts, parks, common areas—anywhere people gather, indoors and out. BECSys water chemistry and filtration controllers are the first automated controllers to be certified by NSF International to NSF/ANSI Standard 50. BECSys controllers successfully met all of the rigorous performance evaluation and testing requirements dictated by Standard 50. Certification to NSF/ANSI Standard 50 is required by most U.S. states. Pen Fabricators, manufacturer of vinyl liners and covers offers a traditional "over the deck" cover that fits all pools. The over-the-deck option is made with 20 mil vinyl water bags that follow the outer edge of the cover with the weight of the filled bags holding the cover in place. This is a terrific option for those who do not want to alter the deck finish with anchors and holes used with safety covers. HydroLightingTM debuts as components that will provide a thrill ride light show. 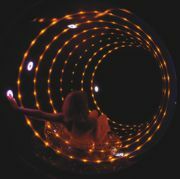 Featuring multiple pre-programmed lighting effects within the waterslide, HydroLightingTM reinvents the body and raft slide experience into a complete entertaining "show" for both riders and spectators with multi-sensory experiences including pulsing, gyrating lights and special effects. The system is user-friendly, affordable and designed to withstand harsh outdoor and indoor environments.